On April 2nd a group of middle school students, teachers and chaperons from Manchester Middle School came together in the second floor Teacher Education Institute classroom and interviewed a Jehovah's Witness survivor living in France. Using Skype, a web cam program and small computer-top camera students interviewed Simone Liebster and heard about her Holocaust experiences. 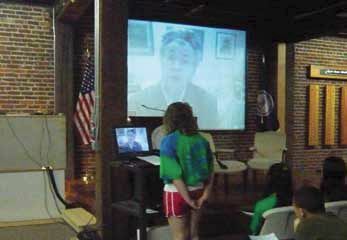 This was the museum's first student-survivor long distance Skype interview; the interview was arranged by the Arnold-Liebster Foundation.